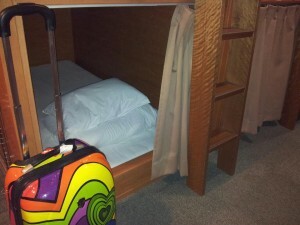 Set it a fantastic location, the hostel is easy to find from the airports and from downtown. There are a couple of eateries in the area (a great cheap tempura restaurant just down the road, near the station). The staff were friendly and helpful (I had lost my luggage and they were helpful in suggesting places to shop). There was a common room with a beer vending machine upstairs. Plenty of computers in the lobby to use the free internet available. Rooms were a little hot, the air conditioning just couldn’t keep up (I was here in summer, it wasn’t unbearable by any means, just not as cool as it could have been). The beds were unusual – they imitated the capsule hotel style, so even though it was a dorm with loads of beds, the noise was limited, as the wooden “capsules” hid most of the noise (and light). The showers were fantastic (had to pay for hot water, but they were clean and had good pressure). Update (the above was written in July 2008, I returned to stay at Ace Inn for 3 nights in December 2012): Once again, enjoyed my stay. Rooms were still a little hot (but it was winter this time) – I think the heaters run a bit high here. I found the beds to be a little hard this time, but I think it was more because I’m not used to the futon style yet (beds were futons on wooden slats). I hired a bike from the lobby, 500 yen for a day, which was a great way to explore Tokyo (and get lost!). Free wifi on most floors, and computers still available in lobby to use. Showers are still 100 yen for hot water, but I stand by my original statement – clean, good pressure, I’m happy to pay 100 yen for that. Staff were still very friendly, had umbrellas available to borrow for rainy days.